The Olympic Stadium will host a dedicated day of Paralympic sport, as part of a three-day event one year on from the London 2012 opening ceremony. 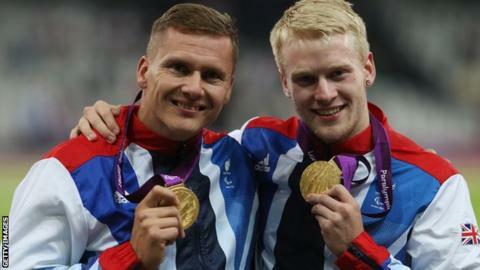 The Paralympic competition will follow two days of Diamond League athletics to make up the London Anniversary Games. The event will take place from 26 to 28 July. London mayor Boris Johnson said: "Now this anniversary celebration is complete with top international Paralympians set to join the party." In January, it was announced that the annual London Grand Prix Diamond League meeting would be moved from Crystal Palace to the Olympic Stadium. London 2012 chief Seb Coe says the three-day event is an "important part of the London 2012 legacy". "I'm sure the London Anniversary Games will go a long way to inspiring the next generation of track and field fans," added Coe. "London 2012 was an amazing year for British sport and what a way to celebrate its success by welcoming the world back to London once more to watch the biggest names in athletics. "It is an important part of the London 2012 legacy that as many people as possible experience world class sport at the Olympic Park." Double Paralympic gold medallist Hannah Cockroft, who won the T34 100m and 200m titles in London, is confident the event will be popular. She said: "It's really exciting. We know we can fill that stadium - we did it with 80,000 people in two sessions a day for 10 days. "We can fill the stadium one more time and if we can do that it shows the interest is still there. "That's a real challenge for us now to see if people are still interested in what we're doing. It's fantastic that we're getting the opportunity to try that out and I guess that's where the whole world will see if the legacy has worked." The Paralympic competition at the London Anniversary Games will follow shortly after the IPC World Championships in Lyon. In 2017 the Olympic Stadium will host the Paralympic Athletics World Championships just one month before the World Athletics Championships - the first time a city has hosted the two championships in the same year.